I have been reading the new Stephen King book for like two months, which is just strange. I mean, there were various reasons behind the delay. I’ve been really busy at work all the time, for one, and a shoulder injury made me loathe to carry it around, for another. (I mean, the injury was not entirely debilitating, and neither is this the biggest book ever printed, but the two factors did not play well together.) These are all true facts, but at the same time, I don’t think any of them was the real problem. Sleeping Beauties tells the story of a world without women, more or less. They’re all here, but once they fall asleep, they get shrouded in a mysterious cocoon and don’t wake up. (Well, they do, for brief periods, if you are too insistent; but that’s a bad idea.) Half the story deals with the world’s, which is mostly to say men’s, reactions to this sudden new reality, mostly via the small Appalachian town that acts as the setting. The other half deals with the supernatural underpinnings of the event, and what this all means to the women who are cocooned away. That first half, wrapped up in a hypothetical reality, no matter how potentially troubling, is where the book shines. There are heroes and villains, small petty vindictive bullies, understandable antagonists, helpless children, and everyone in between. Stephen King has always been a deft master of interweaving motivations, and nothing much has changed in this regard. The second half, in which spoilers abound, is… well, it’s two things. 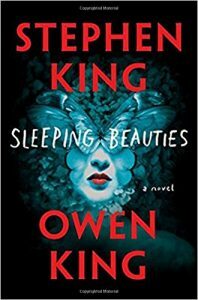 I don’t know much about Owen King, but I do not assume that he is what of this book I didn’t like. At least, not specifically. Because, the first thing is, King’s biggest flaw in my estimation is that his explanations sometimes get too big for him, and end up unsatisfying. That’s less true here than in some cases, but still highly visible. Intertwined with this is the second thing which is: two men are not really qualified to write about how women would deal with the spoilers I’m not going into. This is not my feminism talking, although it could be; it’s more that the outcomes on the page simply didn’t feel true to life. Anyway, I still liked it. But it is definitely flawed. There are definitely a lot of women striving to stay awake, and they matter to the plot. But not, thematically, to this half of the story. If you find that to be some measure of problematic, know that you are not alone. The default author’s son, and co-writer of this book, in case you didn’t use the mouseover text. This is not the proper phrase for what I mean, but I cannot figure out something better. For example, Under the Dome, which would have been better if no explanation had been offered. The only worse answer I can think of is the one the TV show came up with. This entry was posted in Words and tagged fantasy, horror on November 24, 2017 by Chris. 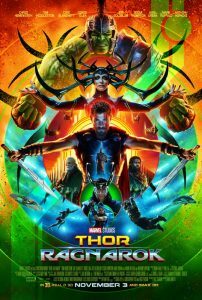 The problem with reviewing a new Marvel movie is the same as the problem with reviewing a new Dresden Files or Vlad Taltos book: too much accumulated past knowledge is required.That is, the only way to come close to getting a coherent thought out of me is if I assume you are aware of everything that has come before. Otherwise, I’m bound to spoil for previous movies. For example, Thor: Ragnarok, which is not only the third Thor movie, it’s in the high teens for total Marvel Cinematic Universe movies overall. And okay, they don’t all of them interweave so tightly that you would need all the movies under your belt, but it’s still something like five or six, just to cover all the returning characters. So, screw it, I’m doing that spoil for previous movies thing. See, the first Thor movie was about learning how to be worthy. Thor starts off as a bro, and needs to be a hero instead. Cool. The second one was about family (and also a little bit about the eventual Infinity War that we’re not quite to, yet, but that’s plot, and I’m talking theme here). Like, Loki is still a bad guy, or at least a mischief guy, but the brothers are brothers again and don’t have to spend so much energy on hating each other. It was nice! This third movie is about becoming an adult. Training wheels are off, the end of the world Asgard is at hand, and Thor (and whoever else is willing to side with him; telling you in advance would be, well, telling) has to figure everything out for himself. Which, not bad for a dude who was a bro like six years ago. I mean, assuming he succeeds. But trying is also pretty cool. Bro Thor from 2011 would not have even tried to do anything except maybe tug on Odin’s arm, unless it was to charge forward blindly and get himself killed in the first thirty seconds. So, that’s what the movie is. Remaining things to know are that it was almost more comedy than action movie; that it has my personal favorite use of a Led Zeppelin song; that of course it was good, although at the same time it’s hard to know how to trust my opinion here anymore; and that… no, I take it back, anything else I could possibly say would definitely be spoilers. Go see it! I mean, I didn’t like the Inhumans series, so at least I know there’s a bottom to this well of good faith. This entry was posted in Film and tagged 3D, action, Alamo Drafthouse, comedy, Marvel, MCU, superheroes on November 14, 2017 by Chris. Today I learned I’d never seen Blade Runner before. I’m honestly not sure how that happened? Nevertheless, I think I was right to want to watch it before the sequel. It will be hard to talk about this without spoilers, mainly because I’ve known so much about it myself, long before seeing it. I guess I will not worry about it much, in order to get some sense impressions out of the way. 1) Deckard isn’t a replicant. This was easiest to determine, because every replicant in the movie had, at one or multiple points, a weird yellowy reflection in their pupils, and he never did. 2) The replicants themselves were mostly sympathetic; they were dealt a raw hand and seemed to be trying to find a way out, and I respect that. At the same time, they were murderous enough to make the blade runner role seem like a reasonable one instead of an arm of the state focused solely on keeping down someone who might otherwise come to dominate humanity. (See also the Sentinels in X-Men.) In fact, the biggest flaw the movie had was exactly that: there was no reason given why the replicants were so murder-happy, and it was a little too easy. 3) Gaff (the guy played by Edward James Olmos who was apparently Japanese for this role?) was a total enigma to me, and I think I was supposed to get more out of him than I did, or maybe I just need to watch it more? Whatever, it was worth commenting on. And, uh, I guess that’s all? A mistake I see I’ve made is assuming you are all familiar with this. 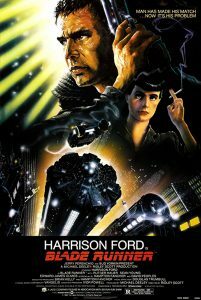 In case you aren’t: Blade runners are special cops trained to hunt down replicants, who are no longer allowed on earth after the most recent version committed some offworld murders and are now seen as glitchy / broken / whatever you call an android when you for some reason don’t think it capable of independent morality. Which reminds me of a little more to talk about after all I guess. Like, what happened to earth? That’s not fair, in retrospect, because of a spoiler I won’t go into, but the majority of what we see is a perpetually rain-darkened shithole where nobody is happy or particularly seems to have much of anything to call their own. Every surface is covered in advertisements, which, okay, that’s valid 2019, but the majority of the ads are inviting people to leave the planet and go somewhere better. And it seems like most people who could leave have already. I’m not sure I have a point, I’m just interested in the backstory of this world. All the parts of it, really. But the part we got was pretty good. This entry was posted in Film and tagged sci-fi on November 4, 2017 by Chris.